Carter's - "Jungle Collection" - Diaper Stacker. Features Miss Monkey with dimensional ears in shades of brown, pink, and white, with pink bow atop her head. Includes two faux suede zebra-printed pockets for extra storage and bright hot pink trimmed edges. 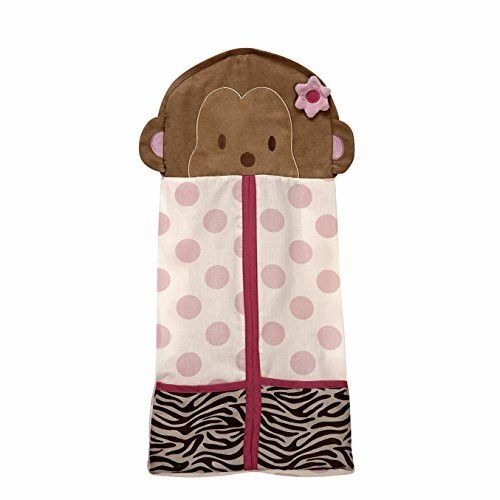 This adorable Miss Monkey diaper stacker has a brown velboa monkey at the top, then accented with polka dot and animal print below, and two pockets then trimmed in hot pink. This diaper stacker helps to keep your nursery organized, holds clean diapers, or fill it with onesies, baby shoes or plush toys. This diaper stacker is made of 35%Cotton/35%Polyester.